Whether you’re worried about security and privacy, or want to put some finishing touches on your property, a significant amount of thought should be put into your driveway gate. Not only can they act as a beautiful and elegant feature, but they can also add value, something that may come in handy in the future. 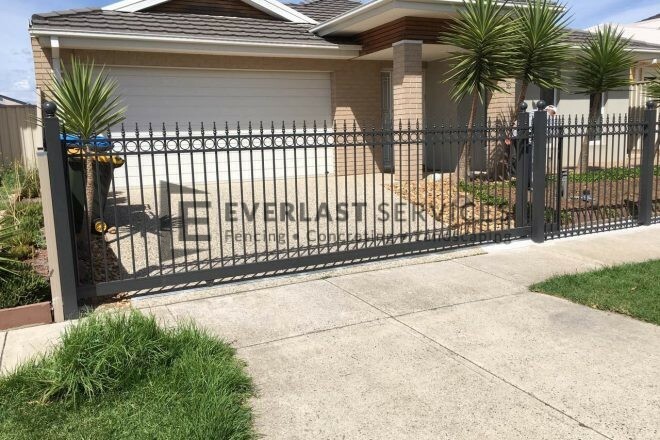 If you are planning on implementing a driveway gate onto your property, then there are many things to be considered. We’ve compiled a handy guide of simple questions you should ask yourself, when trying to select the perfect driveway gate. How do you want your gate to open? The way a driveway gate will open can be classified into two types: one is the sliding driveway gate and one is the swinging driveway gate. While swing gates are the most popular choice on the market today, there are a number of positive attributes of a sliding gate that should definitely make you consider them. What style of gate do you want? Finding a gate style that matches your properties aesthetic is ideal. You must take into account a variety of factors, as your neighbourhood might have particular design restrictions to maintain the existing look of the street and surrounding residential area. With this being said, choosing a gate which blends seamlessly into your home can significantly improve it’s aesthetic, as well as adding to the curb appeal of your home. Different colours and materials work best with different style houses, depending on when it was built and which architectural trend it favours. Do you have a contemporary house with modern trimmings? Slat gating works best for this. Picket gates work well with classic colonial style houses. These are all things to be considered when selecting the perfect driveway gate for your home. How will your gate be accessed? A gate that is opened by hand is the easiest and most foolproof means of accessing your property. However, this also has its downfalls, because it can often also be the most inconvenient. If you’re rushing around, or come home during a downpour, the last thing you want to do is exit your car to manually unlock your gate with a padlock and key. This method, with tools such as swipe cards or electronic pin codes, is a more sophisticated and secure way to unlock your driveway gate. However, these types of access are still not 100% secure. You will still have to give out copies of your gate key, or share your security code around. This approach can be very handy as you can keep a remote control on your keys or in your vehicle. Also, depending on what type of remote control you opt for, you may also be able to buzz guests into your home, without having to go out and let them in yourself. This is usually the safest and most secure option when it comes to gates. Often paired with a security camera, this system allows you to see who is at your gate, without having to go down and check for yourself. Keep in mind though, the more high-tech you go, the more likely the chance of a malfunction and the more expensive the bill. What colour gate would you like? Do you want the gate as a feature? Or do you want it to blend in? If you need a gate, or some advice on selecting the best one for you, why not give us a call? We are honest, reliable and dedicated to your driveway gate projects. We even provide a completely free, no obligation quote.